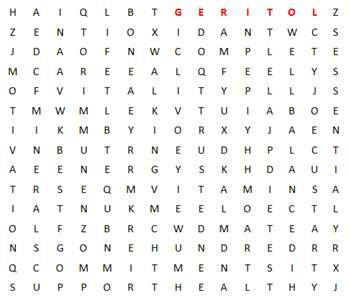 CAN YOU FIND THE 26 REASONS TO TAKE GERITOL® MULTIVITAMIN? Discover how Geritol® Multivitamin, a leading, trusted multivitamin for men and women with 26 comprehensive essential vitamins and minerals, finds the right balance for your body. Even a healthy diet may not provide your body with all of the vitamins and minerals essential in human nutrition. That's why some of your readers may take multivitamins to ensure their bodies receive all of the nutrients they need to stay healthy. Yet, so many multivitamin products today offer mega-doses of the nutrients that our bodies need. 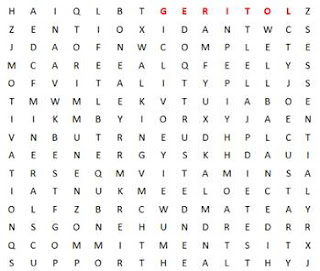 Geritol Multivitamin is the nutritional supplement trusted over time to help enhance vitality, both physically and mentally, by providing the “right balance” of essential vitamins and minerals. It contains close to 100% RDA (recommended daily allowance) of 12 essential vitamins and minerals including: Antioxidant vitamins A, C & E to strengthen your immune system, key B-vitamins for energy support and vitamin D to promote bone health. One Lucky TTGG follower will be winning a $50 gift card toward a pair of New Balance sneakers so you can get up and out and move for better health, Geritol® Multivitamin product, and two Geritol pedometers. 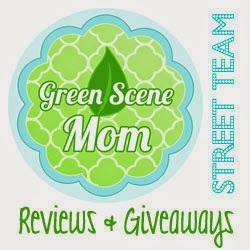 All you have to do to be entered in Comment Below with the Bonus Phrase! Well-balanced. Thank you so much for the wonderful giveaway!